This article deals with the fundamental problem of working in Ostia : how to devise a respectable chronology for a city that was mostly cleared of soil in a few years, with the aid of railways and poor families, for the World Exhibition of 1942. In the absence of photographs and serious notes, we have little to fall back on. I offer a field methodology against despair, applied to the difficult case of the Palaestra. What we need to do is clean up large areas, establish phases between them, and undertake selective excavation of pottery-rich rubbish deposits. From the resultant Harris Matrix, a more nuanced history of Ostia can emerge, of late antique centuries, extending far beyond the « Hadrianic » fantasy of Mussolini. The scale of this exercise makes it possible to assess the reliability and relative utility of different dating methods. Most early methods now fail, but others remain. It seems that future chronology will depend on an uncomfortable cohabitation of old and new. Si tratta di un problema fondamentale per chi lavora ad Ostia : come stabilire una cronologia accettabile per una città che è stata scavata in pochi anni, con l’aiuto di carrelli e di manodopera non qualificata, per l’Esposizione Universale di Roma del 1942. Nell’assenza di fotografie o di seri resoconti, rimangono pochi elementi sui quali poggiare il ragionamento. Contro la disperazione, propongo quindi una metodologia di lavoro sul campo che abbiamo elaborato per il difficile caso della Palaestra. Bisogna pulire ampie aree, stabilire fasi tra di loro e scavare in maniera selettiva depositi di scarico ricchi in ceramica. Dal Harris Matrix che ne risulta, emerge una storia di Ostia più sfumata per i secoli della tarda antichità, e che si estendeva ben oltre la « fantasia adrianea » mussoliniana. La scala di questo esperimento permette di testare la validità e l’utilità dei diversi metodi di datazione : buona parte dei vecchi metodi sono sorpassati, ma alcuni sono ancora utili. Sembra quindi che le cronologie future dipenderanno dalla poco comoda coabitazione tra vecchi e nuovi metodi. The Kent division of the Kent-Berlin Late Antique Ostia Project was directed by Luke Lavan from 2008 to 2011, in collaboration with A. Pellegrino, director of the Soprintendenza of Rome, Ostia section, and A. Marinucci, head of the works on-site. I am grateful to A. Gering for arranging the permit in 2008–2010. In the Ostia site archive we benefitted from the kindness of E. Angeloni and in the depot from the help of P. Germoni. Much on-site assistance was provided by L. Kaumanns and G. Sperveslage. Trench supervisors were H. Harrington, V. Reilly, K. Madigan, J. Fides, Z. Magyar, S. Matz, J. Hutchins, D. Jackson, B. Harp, and M. Mulryan. Finds were supervised by H. Harrington, assisted by A. Hammett and E. Blanning. Ceramics were studied by E. Pamberg, S. Costa, and especially E. Vaccaro. S. Hamilton-Dyer studied faunal remains, D. Holman and A. Rovelli studied coins. A. Sanchez, A. Fitzgerald, and S. Kamani analyzed building decoration and design. E. Luby and L. Figg produced digitized plans and sections, which were finished for publication by E. Boast. M. Mulryan provided archive support and recording on-site in a thoroughly dedicated manner. The project was funded by : a field school grant from the University of California, Los Angeles, in 2009; fieldwork bursaries from the University of Kent in 2008-2010; grants from the Faculty of Humanities at Kent ; donations of Context Travel, Caroline Lawrence, John Osborn, and especially John Beale. I am especially grateful to Michael Mulryan and Nicolas Laubry for editing this text and to Jan-Theo Bakker for reading it. All remaining faults are my own. This article was produced during time supported by a Marie Sklodowska-Curie European Fellowship H2020-MSCA-IF-2014 no 659216 (IntercommunalSpace) provided by the European commission. All photographs are those taken by the Kent Ostia Mission 2008-2012, © Luke Lavan. Fig. 1a – Reconstruction of the Palaestra in A.D. 387. © Will Foster / Luke Lavan. 3 Chronology : see volume 2 of Lavan, forthcoming a. 1To a novice, the potential of the ruins of Ostia seems almost limitless. A walk through the ancient site can conjure up great optimism in an untested scholar. Leaps of imagination suggest that an ancient experience of the city is within our reach (fig. 1a). So it was in my case. My own fieldwork in the city (from 2008 to 2012) aimed to provide a case study (fig. 1b), for wider research into public space in the late antique city, on the nature of streets, shops, and public squares1. I chose Ostia because of the great size of the excavated area. As Axel Gering had noted, it was possible to see the evolution of an entire street system : a system I hoped to study2. Thus was my ambition : reality was something different. Very quickly, I was confronted with the most basic challenge which all of us face in Ostia : how on earth can we date anything ? After all, most of the layers we want to excavate have been removed, long ago, leaving us with masonry skeletons of uncertain date. Scholars often resign themselves to making the depressing statement above. As a result, I began to consider Ostia in relation to a wider study of chronology in the late antique city, which I am currently working on3. It has involved an investigation of 618 instances of public building work, from around the Mediterranean, ranging from road repairs to honorific columns. Yet, of these cases, only 19 % have involved dating obtained from the contextual study of ceramics, almost half of which are in Spain, with some regions almost untouched. Scientific dating has almost never made an appearance. Thus, there is a gulf in professional practice, between the methods we prefer to use to date structures and the methods we actually use, especially when we combine the reports of others into site narratives. In reality, we often rely on very rough techniques, leaving the quality of our dating poor. 2This situation is common wherever clearance archaeology has been allowed to prosper. On many Mediterranean sites, excavation has proceeded at great speed, leaving analysis far behind. Under the gaze of directors of all nationalities, untrained workmen have removed stratigraphy, chasing the last « respectable » Roman stone surfaces, whatever date they may be. A desire to uncover elegant classical architecture has led to earth layers being swiftly removed and consigned to the spoil heap. The ruins so exposed have been left behind as sterile hulks, missing elements of chronology needed to put them into an historical context. In most places, this type of archaeology is now a thing of the past, although clearance excavation is still practised in some parts of the East Mediterranean. The consequences of such an approach are particularly acute at Ostia. So much of the city was excavated at speed, without regard for stratigraphy, especially under Mussolini4. Nonetheless, we still need to discuss buildings uncovered by clearance excavation ; we cannot just exclude them from our discussions of ancient cities. Thus, I have worked to try to salvage something from the wreckage that old-style classical archaeology leaves behind, from my « tourist » observations of ancient cities or from resurveying specific excavated areas. The window of opportunity is often small : as over-excavated sites are prepared for display as archaeological parks, conservation activity ironically removes many features which have never been recorded. Ancient time is also problematic. In salvaging features from someone else’s excavation, chronology is a major issue. How can one date buildings and phases where stratigraphy has been removed and whole walls have been demolished by early « excavators » ? 3Admittedly, chronological problems do not trouble everyone working at Ostia to the same degree. For the Late Republic and Early Imperial period, a wealth of inscriptions, brick stamps, and well-defined building styles makes for a fairly rich chronological resource. Dating is not as superficially straightforward as at Pompei, but we have enough information to think that stratigraphic archaeology is something of a luxury in Ostia, rather than being an essential part of scholarship. But, for the 3rd to 9th c. A.D., things are rather different. This was brought home to me recently by the stimulating Ph.D. thesis of Julian Schoevaert, who investigated the shops of Ostia. Unfortunately, he had no firm criteria to date shops of the 3rd to 5th c. in the city, only the late masonry styles of Heres, which he used reluctantly5. In his predicament, Schoevaert is by no means alone. Many of us depend on dating assumptions and techniques that are somewhat old-fashioned. At Ostia, this is a cause for particular regret. We have here a site arguably richer than Pompei: not a brief snapshot of urban form, but rather a record of one thousand years of Roman urban evolution, which cannot be interpreted without a firm grasp of chronology. 7 « Archaeological cleaning survey » : Lavan 2013, p. 51-91. 4To many, my intervention may seem a little odd. Why discuss old dating techniques when we have new ones ? Surely, all we need to do is undertake further archaeological work and apply current methodology. Well, at Ostia this response is inappropriate. The site is so extensively excavated as to defy the application of stratigraphic methods ; it would take decades of research and millions of euros to sample every building. The ruins have also been extensively damaged, as have so many clearance excavated sites, by the desire to restore an archaeological park with pretty ruins, rather than to recover nuances from soil layers. Conventional excavation is not able to overturn the damage that has been done. Yet, we cannot ignore the old dating of monuments when reading urban histories, like the guide books of Pavolini or the Ostia Antica website of Bakker6. The dates established for buildings excavated decades ago inevitably condition our knowledge of those excavated and studied today. Our understanding of the chronology of Ostia is often « systematic », with many buildings dated collectively. Therefore, any review of how we date needs to consider old and new methods together. This is what we have begun to undertake within the Kent fieldwork at Ostia, as an accidental consequence of the type of methodology adopted: « archaeological cleaning survey ». Our work involves the cleaning and recording of large areas that have already been dug, along with selected excavation of key surface deposits and occasional shallow sondages7. Because of the extent of our works, we can use many types of dating together, and potentially assess their differing value. Admittedly, dating is a dull topic, which often results in unreadable prose. But without some mastery of chronology, what we publish about Ostia has little historical value, no matter how beautifully we write it. Fig. 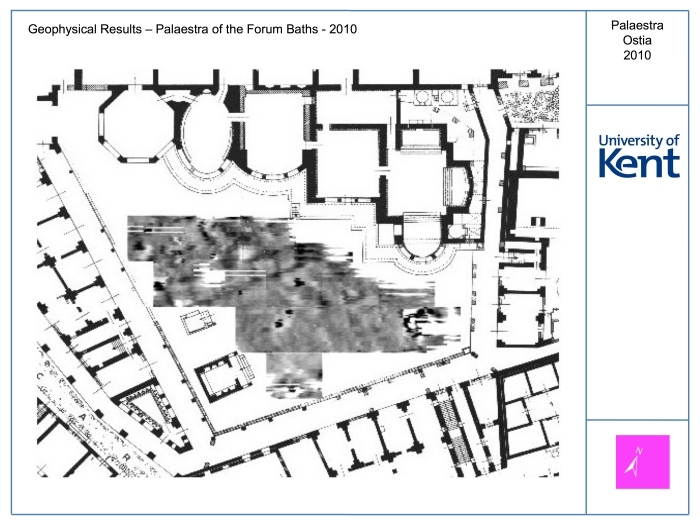 1b – Areas of Ostia investigated by the University of Kent 2008-2012. KEY : TH (Temple of Hercules), NBV (Nymphaeum Bivium), MFS (Main Forum Sidewalk), PFB (Palaestra Forum Baths), MM (Magna Mater), FSE (Foro della Statua Eroica), FSEN (Nymphaeum opposite Foro della Statua Eroica), BNP (Baths Neptune Portico), PDV (Piazzale della Vittoria). Areas MFW, MFR, ABP / CDB, MFP, CDT were excavated by Humboldt University, Berlin (dir. Axel Gering), who have continued their excavation since in other districts. 5So what dating methods are currently used in the city, and how reliable are they ? How do they interrelate with each other ? These are the questions which I will address in this article. I must stress that theories which date « background » urban development, are as important as those used in the « foreground » of current fieldwork projects. 6Up to the mid 3rd c., there is of course an embarrassment of choice available in dating methods. We have inscriptions, often almost in situ, dating a number of major buildings around the city8. Brick stamps also feature, alongside estimations of dates from architectural or artistic style, with column capitals or wall paintings relating to well-dated parallels in Rome or the Bay of Naples9. In this setting, it has been possible to develop chronologies of masonry types in which there are enough fixed points to identify « Republican » from « Domitianic » and perhaps « Severan » masonry10. Janet Delaine would doubtless be able to do something similar for mortar, in parts of the city where there are independently-dated buildings. 7It also has to be admitted that we rely on some « catch-all » dating methods, whereby site-wide principles or region-wide events have been applied to date buildings. For example, we have the raising of the street levels, as seen on the Decumanus under Domitian. This event is believed to provide a TPQ (terminus post-quem) for subsequent building set at the same level11. Moving into the later 3rd c., the recognition of major fires, as in the Caseggiato dei Molini, has permitted similar mass-dating scenarios to be envisaged12. A widespread « collapse » of buildings in the 3rd c. has also been noted, from fallen walls excavated, dated by coin finds (in a few places) or attributed to dates based on historical earthquakes. The occurrence of earthquakes has some support from inscriptions found on site, as well as from ancient writers; the recovery of large fallen wall fragments, adjacent to their buildings of origin, as well as the presence of cracks, makes this plausible. Where there is a credible match between different types of evidence, one might suggest that a known earthquake provides a TAQ (terminus ante quem) before which earlier layers must date. 8Finally, contextual dating based on pottery and coins has made an appearance in the last 30 years, with the return of stratigraphic excavation. Here, layers rich in finds, typically well-mixed secondary rubbish deposits, are studied. Scholars scrutinise the last dated finds in a layer, which are taken to indicate the date when it was formed. These contexts are especially useful, given that Ostia absorbed ceramic wares from across the Mediterranean, and given that such rubbish deposits are common, being used to level up ground for building works. From these layers, full of rapidly changing diagnostic ceramic forms, one can provide dates for construction phases, of 25 years or so, from the « start dates » of the latest materials found within. The reality is, of course, that this method has been practised at little more than a dozen sites in the city13. Most buildings in the city are still dated by somewhat cruder methods. 9From the 4th c., the number and reliability of dating methods decreases. As elsewhere, there is a decline in the frequency of inscriptions, alongside increasing vagueness in their language. This makes dating more difficult: scholars are more likely to cite a reused early imperial text as a TPQ for a late building than to date it with a new inscription from the 4th-5th c. A drop in the use of brick stamps also deprives us of a valuable source, from around the time of Constantine, with some exceptions, notably the episcopal stamps coming from Porta Marina14. Attempts to use architectural ornament as a basis for dating look increasingly difficult. Pensabene sometimes struggles to ground his chronology of 4th c. column capitals with independently datable parallels. He relies more on a belief in a gradually evolving tradition, developing from the 3rd c., with very few fixed comparative points from Rome and elsewhere15. Similarly, the production of decorated wall-plaster seems to have dropped so low as to make it impossible to construct a local typology. Fig. 2a - A reused inscription used as a TPQ: an altar of 242 cut into a projecting entablature block for the Foro della statua eroica. 16 Criticism of Heres : Van Dalen 1991 ; Schoevaert 2013, vol. 1, p. 81-88. 10The study of masonry types once seemed to offer some hope. It reached its most optimistic expression in the work of Heres (1982), which has since been used by many scholars as a guide to dating buildings of the 4th c. to 5th c. Yet, despite the evident value of the close observations made by Heres, doubts have increased about the applicability of her typology ; it appears that too few externally-dated comparanda exist for her later masonry styles, and that more styles overlapped in time than she anticipated16. Our own expedition has carried on Heres’ attention to masonry styles, although on a very local level within the city, to try to detect phases of building work that might have been done by the same group of workers, rather than to construct typologies valid for the city as a whole. In this work, we have looked at the levelling of brick courses within facings, the nature of reuse, and the size and sorting of reused materials. We have also introduced our own assumptions about the chronology of reused material, from archaeological surveys of late antique buildings carried out elsewhere. Thus, the undisguised presence of reused building material, visible in wall facing, is taken as indicating a date after 250, as is any major aesthetic disjuncture, contrary to the style of early imperial buildings. Such assumptions do of course need to be checked against stratigraphy, whenever possible. Fig. 2b - Reinforcement piers added to the W portico of the Cardo, likely after an earthquake, as seen in the nearby Palaestra. 18 Street level changes, observations : Streubel 2010. 11« Catch-all » dating theories persist into the 4th c. The well-attested earthquake of 346 is evoked to date the repair of many structures, such as the Portico of Neptune, which had reinforcement piers added to support the vault in its central section, a feature that can also be seen along the southern Cardo (fig. 2b)17. However, the raising of street levels is the most significant catch-all dating theory used in Ostia. It is very obvious that, in many parts of the city, late antique buildings were constructed at a higher level than those of the time of Domitian and Trajan. But determining when levels changed has not always been straightforward, especially as the (now vanished) street height cannot always be matched to surviving thresholds, because of the presence of an intermediate sidewalk, which joined them18. What caused the raising of street levels? Was it a uniform process caused by an external factor, such as the rising of the water table or flooding19 ? Or was it something more localised, like the raising of street levels seen in some Levantine cities in late antiquity, whereby older street surfaces were simply buried by builders, who had no desire to recover the paving slabs20 ? 12Yoshiki Hori believes that flooding is the key in explaining rising occupation levels, but that this did not produce a uniform reaction. He notes that, within the same street, some buildings sought to avoid flood waters, whilst others did not. On the Via di Diana, flooding was sometimes tolerated ; some property owners raised their floors but their neighbours did not : low ceiling vaults made it impossible. Thus, the inhabitants took refuge on the second floor, during a flood, before descending to reclaim the ground level. We can also note that the Main Forum was not raised up like adjacent streets, even in late antiquity: it kept its Domitianic/Hadrianic level. The Forum’s civic buildings evidently demanded special treatment. Unsurprisingly, there is even evidence within the Forum of radically different heights co-existing in the late period, perhaps with the use of a wooden stairs to join them, evidenced by postpipes, postholes and nails. Here, different levels likely reflected the varied needs of important monuments, some of which would be cleaned up as required, in the event of floods21. 22 On the Cardo and Bivium, see n. 25. On the Eastern Decumanus, see n. 23. 13Our own trenches have been able to make a small contribution to this study of street levels. The excavation of rich deposits, full of coins and pottery, has generated a mid-3rd c. date for the raising of the Southern Cardo. We excavated a fragment of the late street surface as it reached the Main Forum, at a height which corresponds with adjacent elevated late buildings set along this road, such as the latrines of site IV, iv, 5 (fig. 2c). Streets around the Bivium area, where the Decumanus and « Via della Foce » diverge, seem to have been lifted up around the same time, according to deposits from beneath the Nymphaeum Bivium, which was set at a slightly higher street level. Both developments form a contrast to the Eastern Decumanus, where street raising seems to have taken place 100 years or so later22. It is clear that changes in street height were not universally applied : thus, their reality needs to be demonstrated, not assumed. Perhaps the dating of buildings based on their « street level » alone is misguided. Fig. 2c – Street Levels : Palaestra entrance trench, showing fragment of higher basalt Cardo paving (centre), set at the same height as the foundations of the blocking of monumental arch (right), ca. 3rd quarter of the 3rd c. It was later covered by the great white and black mosaic of the Palaestra. The basalt is cut by the late palaestra entrance (rear of photo), which divided this paving fragment from the Cardo. 14Some expeditions, our own included, have on occasion been reduced to using associative dating, by suggesting that loose finds provide an approximate date for related architectural features. Thus, Boersma dated a basin and associated brick floor in the Domus del Protiro to the early 4th c., based on two 4th c. coins lying against the basin, and one of 308 sealed in its rim (though one might normally prefer only a TPQ derived from the sealed coin). Similarly, on the Decumanus, it is tempting to associate loose epigraphic finds (honorific or building inscriptions not actually in situ) with phases of building work, as has been done for the Exedra/Sigma Plaza. Such dating has also been proposed for the late Theatre Portico, where a base of 385-389 found in this area does seem to provide the best available (if weak) date for the structure. Given that both buildings are set at the higher late street level, such inscriptions are supposed to support a late TAQ for the raising of the Eastern Decumanus23. But associative dating can be present within current excavations. In the Kent excavations, we have also felt it significant that coins, glass and ceramics from all contexts of the Foro della Statua Eroica and Palaestra, including in topsoil, seem to come to an end around the middle of the 5th c., perhaps pointing to a collective disuse of the Eastern Decumanus around this time. One could say that associative dating is feeble when taken to date individual masonry features, but it does have some power in describing overall patterns of occupation. Admittedly, the use of associative dating from finds is safer on rural sites, where there may be only one phase, rather than a dozen, as can happen on urban sites like Ostia. 15Despite all this, it has been possible for us, like other teams, to produce some straightforward stratigraphic contextual dating from surviving deposits: we have produced it for the area sacra of the Temple of Hercules, the Nymphaeum Bivium, the south-eastern corner of the Main Forum (area « MFS »), and especially the Foro della Statua Eroica : ceramics finds are described in footnote 25. All of these sites have revealed building work which can be dated to around the third quarter of the 3rd c. For the Foro della Statua Eroica, we also have later contexts, from the mid-4th c. and early 5th c. In each case, rubbish deposits were excavated, rich in ceramics and coins, which could be set into a stratigraphic sequence of surrounding walls and floors (fig. 3)24. 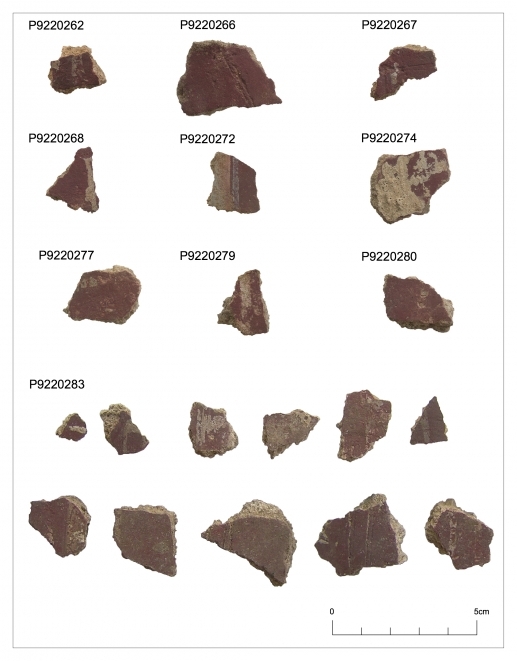 Our ceramicist, Emanuele Vaccaro, found sufficient material to suggest not only terminus post quem dating but also absolute contextual dates for layers, based on the quantity of materials present, with varying levels of reliability [tab. 1]. We did not excavate ceramics still present in the walls, although we would have loved to have done so, as sometimes rims were visible. Fig. 3 – Contextual Dating : context 5046 in the 'Main Forum Sidewalk' (MFS) area, a surviving compact rubbish deposit of ceramics and coins of mid-3rd c. date, lying on the denuded floor of the forum portico. Tab. 1 - Reliability of ceramic deposits for an absolute deposition date (E. Vaccaro, pers. comm., used in Vaccaro and Costa, forthcoming). (4) High reliability = Many fragments, fresh breaks, possible joins, consistency in date, different diagnostics referring to the same MNI (minimum number of individuals). (3) Medium reliability = Less than 20-25 well datable diagnostics, rare or no joins, consistency in date, different diagnostics referring to the same MNI, more fresh breaks than worn potsherds. (2) Low reliability = Less than 10-15 well datable diagnostics, no joins, consistency in date on some occasions, no or occasional diagnostics referring to the same MNI, balance between worn fragments and fresh breaks. (1) Very poor reliability = Up to 5 maximum well datable diagnostics, no joins, consistency in date just occasionally, no diagnostics referring to the same MNI, more worn fragments or very few ones. (0) None = No processed pottery. 16From these high-quality contextual dates, it was possible to revisit masonry types to suggest chronological differences between some facing styles – the beginnings of a local typology, to replace that offered by Heres, although I would not dare to expand its use beyond the centre of Ostia. Firstly, building work from around the third quarter of the 3rd c. seems to have been carried out in carefully chosen bricks, probably not reused, with putlog holes for scaffolding and occasional courses of tufa (fig. 4)25. Secondly, poorly sorted reused brick facing occurs in 4th c. structures prior to the raising of the Eastern Decumanus (which likely happened sometime between 346 and 389), especially in foundations26. Thirdly, there is the type of wall-build, in tile and tufa, known as opus vittatum mixtum. This has a wide date range and should not always be thought of as « late ». Yet this type of masonry was predominant (employing reused bricks) in the latest walls we encountered (probably of 5th c. date), in the Foro della Statua Eroica and the Palaestra of the Forum Baths. Admitedly, we know of one example, within the area sacra of the Temple of Hercules, that seems to be from the third quarter of the 3rd c., which is dated contextually by coins and pottery27. Fig. 4 – Masonry Facing, 3rd quarter of the 3rd c. : Brick (mixed but not obviously reused) with occasional tufa courses and putlog holes (on right hand side of picture). External face of the Foro della Statua Eroica (phase 1a). 28 Decoration sequences and replanning of Forum : Lavan, forthcoming b. 17An equally significant development of masonry studies, in phasing and chronology, came through the study of decorative sequences on a large scale. We studied the remains of different types of wall-attachment for (now robbed) marble revetment, whether stone dowels with iron nails, marble dowels with bronze tabs, bronze tabs alone or only mortar for adhesion. We mapped the extent and phasing of these attachments, taking care to note when the revetment dowels were built with a wall and when they were cut into it, so that the « decorative system » could be entered into our Harris Matrix. This became especially important in trying to unravel phasing in areas where stratigraphy had been removed, as in the south-east corner of the Main Forum (where a radical replanning was detected) or in the late restoration of the Nymphaeum opposite the Foro della Statua Eroica. Here, careful study of revetment attachments revealed that it could be tied into a rebuilding in mixed reused brick, relating to a refurbishment of the drainage system. Surviving revetment pieces were very thin, and those from inside the fountain were reused, confirming the marble coating was late (fig. 5a-5b)28. Fig. 5a – Decorative sequences : Nymphaeum, opposite the Foro della Statua Eroica, showing late marble revetment, in grey and white (here rendered yellow), established after a water distribution pipe was removed, but at the same time as the right hand corner was rebuilt in reused bricks. Fig. 5b – Detail showing stratigraphic connection of revetment to nymphaeum repair: Above: repair in mixed reused brick, with revetment hook built at same time. Below: original brickwork, with revetment hook and stone dowel cut in secondarily. 29 Excavation notebooks : AA.VV. (1938-40), (1938-42), (1941-50). 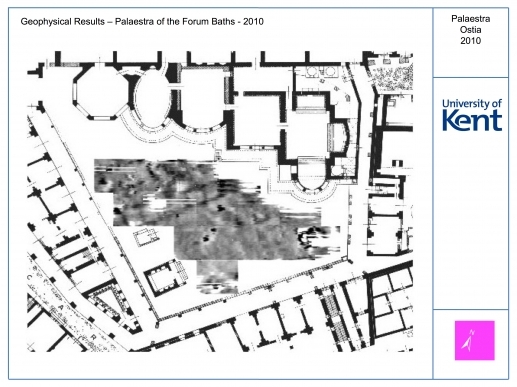 18To understand the significance of our application of dating methods and their limits, it is best to look at our most challenging area as a case study : the Palaestra of the Forum Baths. Very little archaeological data remained here that was suitable for the finer methods described above. Research conditions were made problematic by the nature of previous archaeological work. The site was cleared in the late 1920s and 1939-1940, and the records we have of these activities are sparse, including only a few photographs and no drawings. Excavation notes consist of inventories of epigraphic and sculptural finds and very little else29. The few photographs that were taken reveal a significant fact : late walls and floors which were present during excavation have been removed from the Palaestra sometime later, with the goal of transforming the plaza into the aesthetically-pleasing space that it is today30. This « restoration » process also removed blocking walls from between intercolumniations. Columns found dumped in the centre of the plaza were re-erected. A good number had to be stuck together from fragments, a process that continues today31. 32 Excavations in 1990s : archive photos R6411-3, R6411-4, R6413-30, R6413-31, R6413-32, R6413-33. 19More recently, in the mid 1990s, excavations led by Alfredo Marinucci took place in parts of the Palaestra. 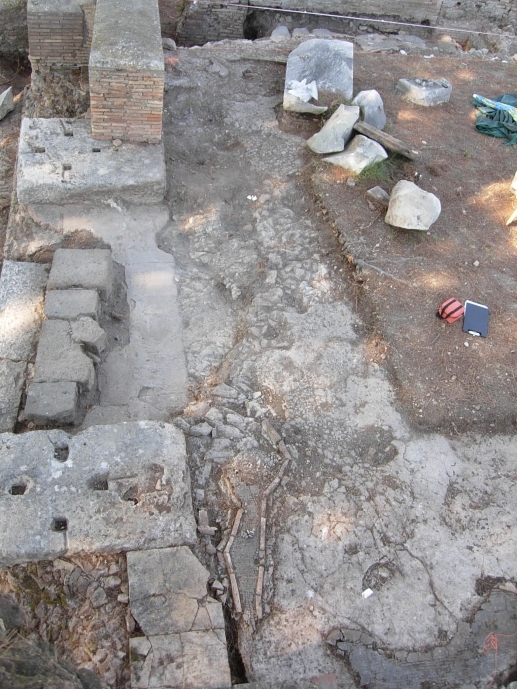 These excavations have not been published, and the records for them in the Ostia Archive are limited to a series of annotated polaroids (which seem to relate to a restoration of a drain). We were able to locate a pottery dump (in a sewer inspection hatch) and back-filled contexts (in our portico trench), which perhaps relate to this campaign. The backfill layers were identifiable, as they lacked tesserae or rims32. 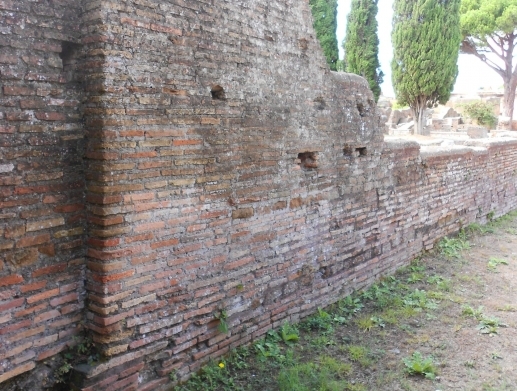 The adjacent masonry structures of the Forum Baths have, however, been published in exemplary detail in a monograph by Marinucci and his colleague Cicerchia. As part of this, they made a survey of the sculptural finds from the Palaestra, and wrote up some of their observations on the plaza, if not in the same degree of detail as their work on the baths. Brief surveys also took place under Heres (of masonry) and Pensabene (of architectural fragments), suggesting dates for buttresses in the portico, or for capitals included within the colonnade33. Some of these features were proposed as being 3rd to 4th c., although it was claimed that late antique impact on the plaza was not very great. Fig. 6a – The Palaestra under excavation by Kent 2009. Topsoil test pits were used to evaluate the level of survival, before open-area cleaning, masonry recording and stratigraphic excavation of surviving deposits. Fig. 6b – Plan of Kent excavations in the Palaestra, with Palaestra entrance just off the plan. 20Our expedition was able to considerably enhance the later history of the Palaestra by recording minor details which had previously been ignored : (i) differences in construction heights between buttresses, (ii) interfaces between surfaces, (iii) mortar traces, (iv) dowel holes for veneers, (v) spoliation patterns, (vi) robber trenches, indentations and pits. In short, we recorded minor nuances within an architectural frame built in the high days of empire, which had experienced two phases of robbing and from which two other teams had excavated almost all of the stratigraphy. One might think our fieldwork somewhat ridiculous, given the condition of the Palaestra: a sort of « archeologia masochista »/« masochistic archaeology ». It was certainly a less glamorous form of late antique archaeology than that which I had experienced in Turkey. The late archaeology of Ostia was not always a pleasure to record : its features could be so fragmentary and thin as to seem meaningless. But this banal, unaesthetic record of repair, when arranged into a sequence, revealed not only continued occupation of the plaza, but also that some « early » architectural features did in fact date later ... from late antiquity ... which was a period in which classical public buildings were often repaired and cherished, not just abandoned or given over to industrial uses. 35 On the laser scanning see : Hori – Lavan 2015, p. 634-635, 645-646, 650. 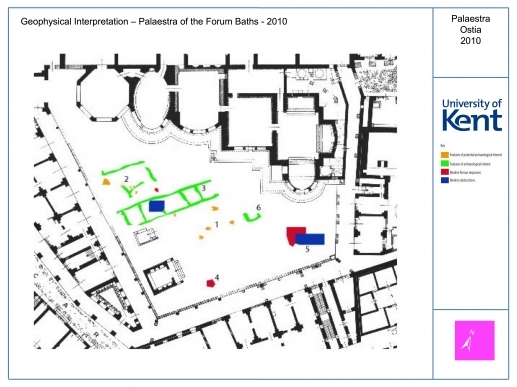 21The work of Kent in the Palaestra34 over seven weeks in 2009-2012 (fig. 6a and 6b), was directed by myself and supervised by Michael Mulryan, Sebastian Matz, and Jenny Fides, with laser scanning by Yoshiki Hori of Kyushu University, as part of a Leverhulme Visiting Professorship35. Our research sought to recover a late antique chronological sequence from the complex : for the plaza area and portico only, not the buildings behind. This had to be done at a minimum cost of money and time, much of which was spent removing and backfilling topsoil by hand, due to the inaccessibility of the site for machinery. Our permission from the Soprintendenza was for cleaning. This was defined by its then-head Angelo Pellegrino as archaeological work to a depth of 60cm below the soil surface, over large areas, supported by occasional small sondages, approved on request. 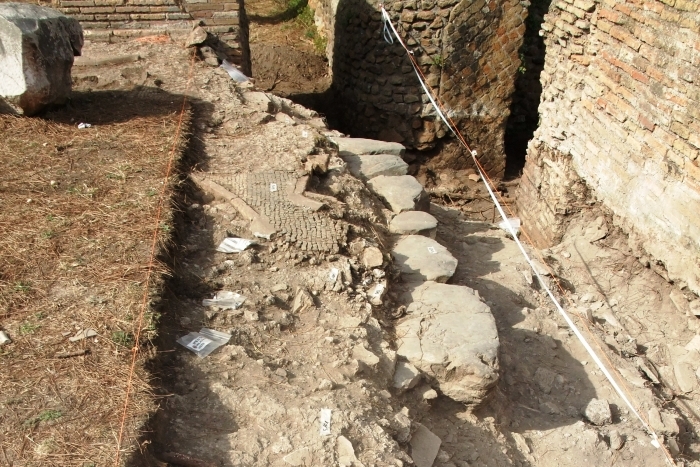 Our fieldwork might seem like a very superficial form of archaeological investigation, but Ostia has been occupied and excavated in such a haphazard manner that Republican to Post-Medieval phases are often visible together, after cleaning, and can be organised fairly easily into a stratigraphic sequence. 23The accepted view of the Palaestra (as published by Marinucci/Cicerchia or Pensabene) was that it was constructed as a single development in the Antonine period. This porticoed trapezoidal plaza, surrounded by tabernae, containing two temples, was a contiguous part of the adjacent Baths, with which it communicated via a vaulted passageway36. Whether the « Palaestra » served as an exercise yard is not known. The plaza also had its own entrances from the Cardo. Fourth century developments in the Palaestra were thought to be limited to the replacement of a piered portico by one incorporating columns, or at least the insertion of some Ionic capitals, which were judged to be 4th c. on stylistic grounds. 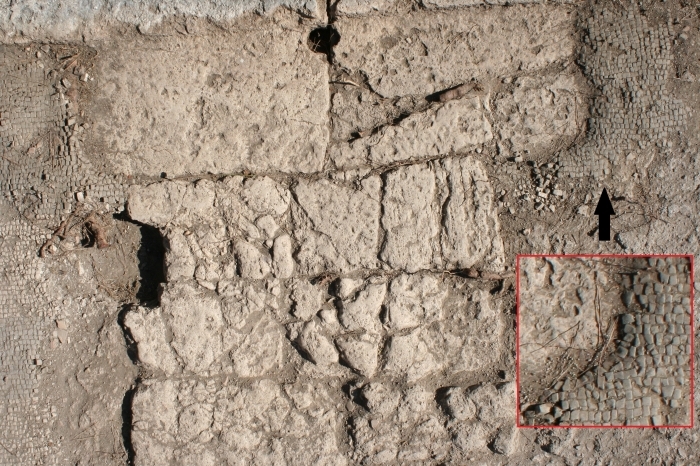 These developments have been tentatively connected to a new apse given to the Forum Baths around the time of Maxentius (brick stamps), and two building inscriptions from the same complex (precise context unknown) mentioning Fl. Octavius, who was a praefectus annonae sometime after 32637. Heres believed that the brick piers, which secondarily reinforced the Palaestra portico, ranged in date from the first quarter of the 3rd c. to the early 4th c.38. 24Our own work takes quite a different view of the later chronology of the Palaestra. But it also adds a few details to the primary construction phase of the complex, and what preceded it : (i) we have detected no trace of an original portico made of piers, as envisaged by earlier scholars; thus some of the column bases and the columns in the extant portico may be Antonine, although they were re-erected, at least once, within late antiquity ; (ii) we can confirm that the original Palaestra paving was of travertine, into which the surviving travertine portico stylobate and its drain were bonded39 (fig.7a); (iii) the small temple was originally a square fountain, with openwork screens, comparable in design to the Fontana con lucerna on the western Decumanus40. Fig. 7a – Surviving patches of travertine paving, into which the portico stylobate is integrated. 25Finally, our magnetometer survey of 2010 revealed a plan of the district prior to the construction of the Palaestra, which suggests a quite different organisation (fig. 7b-7c)41. It shows a row of cellular rooms, cutting across the area, suggesting an earlier smaller plaza, courtyard or garden, in which building orientations were different. Only the temples of the Palaestra come close to sharing these previous alignments. What date this arrangement was we cannot tell, although likely it relates to the pre-Domitianic organisation of the area. Fig. 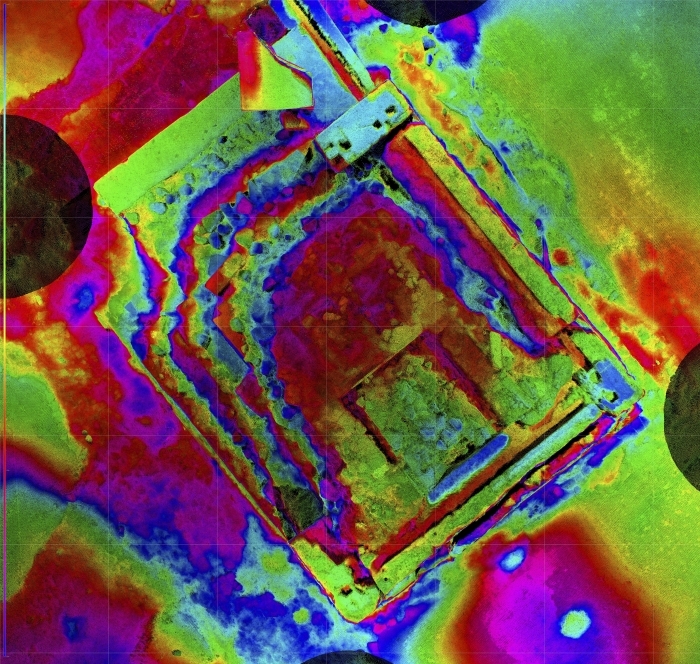 7b – Palaestra of the Forum Baths, magnetometry survey of Kent, showing high magnetic anomalies, including buried walls, in darker black. Fig. 7c – Palaestra of the Forum Baths, magnetometry survey of Kent, interpretation (M. Charlwood). 26But our main focus has of course been on late changes to the Antonine construction, i.e. « secondary » modifications which were not planned by its original builders. These can be organised into clear phases, due to the presence of a marble revetment and a late mosaic, both of which affect nearly the whole Palaestra, and also because of changes in the level of occupation across the plaza. In a few places, clear stratigraphic relationships also are visible, allowing a Harris Matrix to be created. 27In phase 1, some of tabernae entrances, leading off the portico, were altered (fig. 8). Over time, some of these openings were blocked, as the rooms behind were re-planned in a different manner. We have at least two phases of blocking in one doorway, after the primary construction phase, suggesting perhaps a Severan date, alongside a third example, where a shop threshold was raised. The first major modification to the plaza (phase 2) covers over all of these features. The entire back wall of the palaestra portico, alongside two of its tabernae, was given a luxurious marble revetment. It measures ca. 2.5m thick where it survives, at its base, where one usually finds greatest thickness in such cladding. The remaining pieces are of grey-white (likely cipollino) marble. Marble dowels relating to this revetment suggest that it was composed of large slabs, reaching about 1.8 m off the ground, punctuated by a band of darker grey marble running through the middle. The dowels, with bronze nails, were clearly cut secondarily into the wall rather than built with it ; they also cut into the « blocking walls ». The same style of two-colour revetment is found elsewhere in our areas: on the late rebuilding of the Nymphaeum opposite the Foro della Statua Eroica and also after the mid-3rd c. reorganisation of the Main Forum corner by the blocked arch, although usually hung using iron nails. Here, the use of bronze nails suggests a late date, as this use tends to be chronologically later than iron nails, in most dated examples I have seen. It is highly significant that the revetment extends only along the rear wall of the Palaestra portico, and not inside the entrance passage leading to the late Cardo entrance, established in phase 3. The white marble revetment on the large temple in the Palaestra likely dates from the same period, being identical in form. Fig. 8 – Blocking of tabernae in the portico back wall. Below: doorway blocked twice in opus latericium before being covered by marble revetment (line of holes). Above: doorway blocked with opus vittatum mixtum at later stage, not covered by marble revetment. 28Associated with phase 1 or 2, but definitely before phase 3, were a number of minor features. Firstly, we have the installation of a series of basins on the paving of the portico, each in front of a column. These seem to indicate problems with the water supply, and were likely designed to capture rainfall from the portico roof. Today, only one of these basins survives in situ (fig. 9b), but their position is marked on the paving by holes cut secondarily into the sewer below, and by gaps left in the great white mosaic of the Palaestra: in these spots, the original travertine paving survived and tesserae were clearly laid to fit around the new basins (fig. 9a). Fig. 9a – Traces of basins within the great mosaic: marked by preserved areas of the original travertine paving, with holes cut through into the drain below, and by patches in the tesserae which were set to fit around the basins. Fig. 9b – Surviving basin, set within a mortar layer that also supports the column base of the adjacent portico. The column itself is restored. 29Probably connected to these water problems, we see the fountain within the plaza converted into a small temple (fig. 10a), employing much reused material and large sheets of very thin marble revetment. These sheets are stuck onto the outside without nails or dowels. A very thick layer of mortar covered the rear wall of the building, so that the marble revetment disguised the original shape of the structure (as seen in fig. 10b). The interior of the fountain was raised up with a flat mortar level, and given an opus sectile floor of small slabs of varied marbles and schist, whilst steps were added to the front, with an altar placed here, of which the socle survives. A cult statue base, revetted in thin reused veneers, was cut into the back wall of the building. This small temple must have been established before the great white mosaic of the Palaestra lapped up against its walls (fig. 10b). It is also likely that the portico colonnade was rebuilt in this period, but discussion of this is best considered under phase 4. Fig. 10a – Conversion of a small fountain into a temple, laser scan (Y. Hori), showing height differences a false-colour depth interval set at 15 cm. Note how the square structure with deep grooves to support a marble screens, has been extended one on side, and been cut to create a statue base on the other. A mortar layer has covered the marble interior of the basin, to support opus sectile pavement, visible partly as depth shadows in the bedding. Fig. 10b – Relationship of marble revetment of small temple (former fountain) to the great white mosaic. On this side, projecting parts of the fountain are hidden under a very thick mortar layer. The mosaic's mortar bedding also covers the porch of the new temple. 30The great white mosaic, with a black border, covers the plaza and is also present in the portico (see fig. 1a). It replaces the highly worn travertine paving, which was mostly ripped up, except in places where it was covered by basins or where it made up the portico stylobate and its drain. Perhaps as a result, the mosaic is very uneven in places, in relation to surrounding surfaces. An interesting feature is a large rectangular patch in the mosaic, between the two temples, where the travertine has survived. This patch is adjacent to the portico but does not line-up with a column nor with any hole cut into a sewer. Thus, it is unlikely to have held a basin. Rather, we might think that a statue base stood here. Was it for one of the odd collection of animals discovered in the rear rooms, or for the consular statue found reused in a late wall ? Probably it was for neither. The size of the « gap » (measuring ca. 1 x 2 m) is more appropriate for an equestrian statue, of unknown date. It is important to note that the great white mosaic extends over a larger part of the plaza than the phase 2 portico revetment programme. In particular, it includes the long passage leading to a new entrance, cut into the corner of the Palaestra nearest to the Main Forum (fig. 11). Here, the mosaic overlies the basalt road surface of the Southern Cardo, a surface that was established as part of the blocking of the monumental arch leading into the forum. It was blocked during the reorganisation of this forum corner, around the third quarter of the 3rd c.42. Shortly after this development, a new pedimental entrance with brick steps was established here for the Palaestra, coming in from the Cardo, at the same time as the great white and black mosaic floor was laid out. The new mosaic also appears to be contemporary with a repair of the adjacent corner of the Forum Baths, which was given a new monumental doorway leading onto the Forum, set at a higher level, the same level as that of the mosaic. Fig. 11 – The new Palaestra entrance, showing the bedding of the great white mosaic with black bands, which (as a mortar underlay) extends right up to the foundation blocks for the late pedimental entrance from the Cardo, with which it is contemporary. 31Phase 4 of the Palaestra is made up of a series of opus latericium buttresses/reinforcement piers that have been built around many of the columns or set laterally across the portico. Large iron clamps were used to bind the reinforcement piers to the old walls, suggesting this metal was not scarce at the time. These piers clearly break through the great white mosaic, which was repaired in an ungainly manner, mixing up black and white tesserae. Nonetheless, the new piers were revetted in thin sheets of cipollino marble attached with bronze nails, but without marble dowels. It is also important to note that the piers were added when the revetment of the back wall of the portico was still in place, which is not true in the case of a second set of piers, as will be discussed below. The repair of columns in the portico, which can be seen in the form of ancient metal clamps joining together sections, should date before phase 4, as its reinforcement piers make the columns largely redundant in a practical sense (fig. 12). Quite when the variety of columns of different marble (identified by Pensabene) entered the colonnade is not certain. Judging from our excavation photographs, one in situ column base was set in the same mortar level as the surviving stone basin. It should thus belong to phase 2bis. Sadly, the columns we see today are not in situ : the only one that was found in place has now been replaced by a different column. Perhaps during the same phase of repairs (2bis), the marble revetment on the portico back wall was patched in places, a nuance revealed by the presence of some non-original nails, in iron not bronze, alongside the dowels. Fig. 12 – Portico of the Palaestra, showing reinforcement piers and markings for a metal clamp to repair a broken column (right hand column, halfway up). Note the doorway with opus vitatum mixtum behind the re-erected statue. 32Phase 5 of the Palaestra can be seen in the conversion of the tabernae behind the portico into a large marble-clad complex (of mosaics and opus sectile), which possibly served as a domus, or a school or some other semi-public function43. This phase involved blocking the entrances of tabernae with walls, either of reused bricks, containing tufa levelling courses, or of opus vittatum mixtum (as above, fig. 12, behind the statue), and the raising of some rooms inside the complex to create a porticoed « loggia », which likely was a slightly later development than the initial blockings. The opus sectile wall revetment inside the new complex was quite different to that seen earlier (fig. 13a). It was composed of very small pieces of reused marble (including a drain hole cover), assembled into larger panels, with only mortar, not dowels, to attach it to the wall. 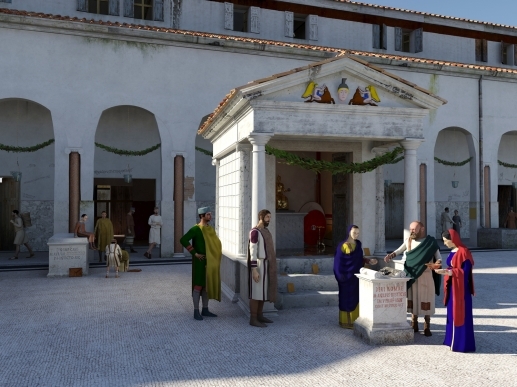 One shop doorway, leading out onto the Palaestra, was blocked with opus vittatum mixtum and covered in purple-red wall plaster. This was probably done in order to make up for the fact that here, on the back wall of the portico, there would be no marble revetment, as elsewhere along this wall. The purple-red plaster was scored with straight grooves and decorated with a series of white lines which include serifs, which may represent an inscription (fig. 13b). Fig. 13a – Opus sectile wall revetment used in complex established inside former tabernae. Note it is composed of very small slabs, arranged into large pieces. A drain cover is reused in the lowest register. Fig. 13b – Distinctive purple plaster recovered in a specific concentration under a blocked doorway in the Palaestra portico (shown on fig. 8 and fig. 12), with white lines perhaps representing an inscription. 33After this, robbing begins (phase 6), with the stripping of lead water pipes from the floor of the portico and of revetment from its back wall. It is followed by phase 7, which involved a final reassertion of the monumental value of the portico: a second series of opus latericium reinforcement piers were established, built directly against the portico back wall, from which the marble revetment had been stripped. These piers are set at a higher floor level than the white and black mosaic, and have no traces of revetment or revetment mortar on them (fig. 14). After these lateral piers, there is phase 8, a time of « privatisation », which sees the blocking of the portico colonnade with walls of opus vittatum mixtum. In this phase, floor levels inside the portico are set at a level ca. 50 cm higher than the old stylobate. This does not need to imply that the plaza itself had been raised up. Phase 8 may also have seen the collapse of the portico behind the small temple. The limited earth build up under the vault suggests that this collapse did not long post-date the abandonment of the mosaic floor, now partially stripped of its tesserae. We might also expect the incorporation of statues into walls, as building materials, to date from this time. There is also a theoretical phase 9, characterised by pits and the establishment of stake-hole structures, around the temple or within/in front of the portico, all of which must date after the phase 3 mosaic, although we have little stratigraphy to place these features within a sequence. Fig. 14 – Reinforcement piers in the portico, second group, established at a higher floor level (without revetment), after the removal of revetment from the portico back wall. 34It is challenging to set all of these phases within a chronological framework. Fortunately, the large area cleaned by the Kent mission allows us to apply many different dating techniques : from contextual ceramics to catch-all dating theories. Firstly, the existence of water supply problems in Ostia seems likely to have been a post-Severan phenomenon: late nymphaea, like that at the Bivium, are equipped with large storage cisterns, in a way that earlier structures were not44 This « catch-all » assumption (based on water supply) might help us suggest a date in the post-Severan period for the basins established on the Palaestra to trap rainwater, although their unaesthetic nature also suggests a date after ca. 250. Secondly, the adornment of the back wall of the portico, with white and grey marble revetment, seems to be part of a wider programme of works within the city centre, based on local decorative parallels, some of which can be independently dated. For example, the Nymphaeum opposite the Foro della Statua Eroica also has white marble revetment with a grey band running through it. This was cut into an earlier wall, but was bonded with one rebuilt section, which employed many poorly-sorted reused bricks (see figs 5a-5b). The revetment here seems to have included a reused slab bearing a damnatio of Gallienus (so after 268) ; it was also very different to the revetment of the adjacent Foro della Statua Eroica, that dated from the third quarter of the 3rd c. Perhaps the revetment of the Nymphaeum was Tetrarchic. This might also be the date of the marble decorating the rear wall of the Palaestra portico, although it lacks signs of reuse, visible only in the interior of the temple there45. 35The great white mosaic of the Palaestra, laid down after the revetment of the small temple and of the portico, must have been established after the raising of the Cardo, around the third quarter of the 3rd c., an event which did not affect the Palaestra itself. The levels of the two areas were only joined together at the time of the great white mosaic, through the new grand entrance into the square. However, for this great mosaic, we also have some dating based on contextual ceramics, from the recovery of an early 4th c. rubbish deposit within a damaged part of the plaza. Here, no mosaic survived, but its bedding was exposed, on and in which was found this deposit (contexts 5300 and 5301). Its ceramics gave a mid 3rd to very early 4th c. deposition date, with a « reliability » of 2.5/4 to 3/4 and 2/4 to 2.5/4. This is clarified as « a depositional date, with a range of doubt, around 300 » by E. Vaccaro (pers. comm.)46. As this was a secondary rubbish deposit used as fill, we would expect it to have been laid down sometime in the 25 years following the early 4th c., so perhaps 300-325. Admittedly, the deposit, was covered only by topsoil when we found it, but it contained no obvious contaminating material to support a later date. It is most probable that the deposit was put down here as part of levelling operations to support the mosaic floor. Elsewhere, we can see that the bedding of this mosaic contained a lot of heterogeneous materials, such as roof tiles, mixed in with the mortar underlay for the tesserae, so it is very likely that fill containing rubbish deposits was used in places. 47 Earthquake of 346 : see n. 17 above. 36The reinforcement piers in phase 4 cut through the great white mosaic and thus must have taken place sometime during or after the mid 4th c. Whilst I dislike to invoke earthquakes, it is fair to interpret reinforcement piers under vaults as a reaction to seismic damage. Furthermore, a large part of the Palaestra portico which has no piers is that part where the collapsed vault lies today. It is very tempting to see the piers as a reaction to the historically-attested earthquake of 346. This event has a good grounding in epigraphic attestations of repair specifically mentioning earthquake damage in central Italy, notably associated with the time of governor Fabius Maximus in Samnium47. After the first set of piers, the subsequent Palaestra sequence of embellishment, robbing, and rebuilding gives us no fixed markers. The second set of buttresses, installed when robbing had removed both the revetment and the portico floor, were set above the mosaic level. They perhaps relate to another historically-attested earthquake of 44348. Unfortunately, we have little to fix the events of the sequence, between 346 and 443. Thus it is tempting to see the purple wall-plaster and the veneer of tiny fragments, relating to the « school » established in the shops behind the Palaestra, as dating sometime in the later 4th c., but before 410, when Alaric’s incursion had disrupted urban priorities. One might also suggest that the first robbing of the portico veneer occurred after 410, as new political realities forced priorities to change. This certainly reflects a sequence of events attested in the Forum of Caesar but is not something anyone can be sure of. We can at least say, from associative finds across the final Palaestra deposits, and from the topsoil which eroded from it, that the occupation of the plaza is likely to have come to an end by the mid 5th c., or have radically changed in intensity by this time49. 9 : Pitting and wooden structures after 450? 37The late repairs of the Palaestra were not only extensive but of many phases. In place of one late antique restoration phase we how have eight, plus an intermediate phase of robbing. Furthermore, we can reveal that these were often part of wider large-scale works in the central area of Ostia, which affected more than one building at any given time. 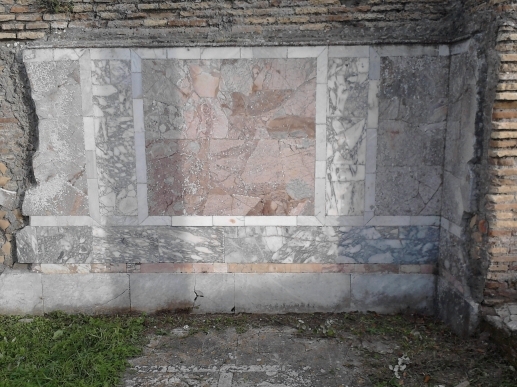 Thus, the luxurious marble revetment of the back wall of the portico (phase 2) seems to be matched with a similar pattern at the Nymphaeum opposite the Foro della Statua Eroica, and indeed in the Main Forum, work which might date from the time of the Tetrarchy. The great white mosaic (phase 3) seems to date from the time of Constantine, and is probably part of the same works as seen on the Forum Baths. The reinforcement of the porticoes (phase 4) might relate to wider post-earthquake works seen in the city, such as butresses in the porticoes of the Cardo, in the Portico of Neptune, and elsewhere in the city. 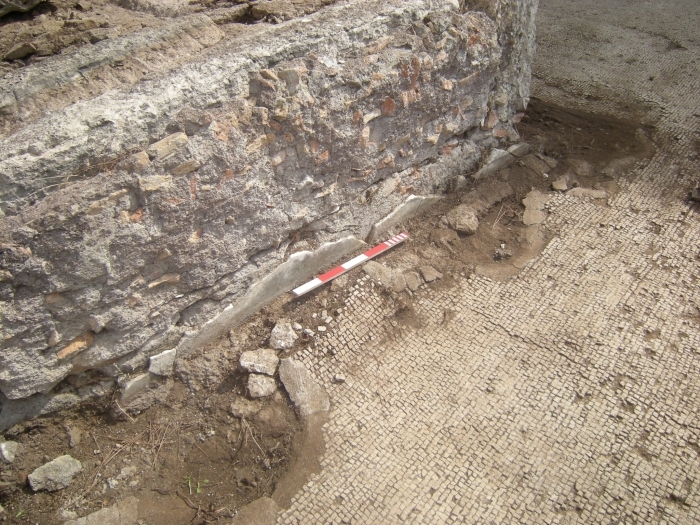 The second phase of reinforcement piers in the Palaestra (phase 7), might have been inserted at the same time as repairs of later 5th c. date, now recorded by Gering, in the adjacent Forum. Here a late paving is ascribed to this time based on ceramics, rather than any indication of repairs that were anti-seismic. Thus, It makes sense to study the chronological problems of Ostia not just in terms of comparative dating but in terms of large-scale phasing. It may actually be the use of the Harris Matrix on a large scale, including decorative sequences, which will allow us to date the buildings of Ostia in the most reliable manner. 38As to the effectiveness of specific chronological methods (tab. 2), it is obvious that we have had to employ a great variety of methods, including embarrassing « catch-all » dating theories (even earthquakes ! ), alongside modern contextual dating derived from stratigraphy. Ceramic dating has saved us from circular arguments, but it has not really been possible to bring in « new » methods to entirely replace « old » methods, although we have refined the use of the latter. A hierarchy of dating methods is justified, with contextual ceramics at the top, although the ranking of other methods will remain controversial. However, the key to dating building work has been to worry less about what methods to use and to concentrate more on establishing phases between adjacent areas, so that links to ceramic deposits can be applied and compared as widely as possible. We can overturn the mistaken belief that all the late antique stratigraphy has gone, although most of it has. We can still do archaeology here – there are enough traces – and thus we can redate many « floating » building phases inside Ostia. Chronologies derived from « archaeological cleaning survey » must remain a little provisional, of course. Our own methods are not a substitute for full excavation. Yet, full stratigraphic excavation is too expensive to be practical and is not able to document large-scale phasing in open areas as effectively as can « archaeological cleaning ». It also not very suited to the slight traces of late antique occupation, which such survey records. 39I would finish by noting that the presence of clearance excavation at Ostia was not simply one of primitive technique. In the years leading up to World War Two, it replaced more careful excavation that had been conducted by Italian archaeologists of the earlier 20th c. But the use of clearance excavation was not only a matter of politics, of archaeologists forced to dig badly by Mussolini. Even after the fall of Fascism, parts of Ostia were still excavated with minimal documentation, as notebooks from the later 1940s and 1950s show50. Clearly, some people appreciated what clearance archaeology could do, and, once begun, such habits were hard to break. This is by no means an Italian phenomenon. A few decades earlier, very similar things were happening in English abbeys and castles, as the Ministry of Works and other organisations cleared away stratigraphy on a large scale, with the aid of railways and unskilled labour. What had to change was an acknowledgement that Medieval soil features were worth recording. The same was true at Ostia. Ironically, I have also been able to show that it was not only late « squatter » occupation of degradation and decay which suffered under clearance excavation, but also the final « Roman » phases, which were confused or ignored. But this last classical-looking period of the city is of considerable interest. The marble-cladding of Ostia, which makes the site so distinct from many other cities in Italy, was largely a late antique phenomenon. Indeed, the 4th c. saw the final flowering of this great port, previously a place of plaster and brick ; a glorious bloom that is well-worth recording, dating and interpreting for visitors to the ruins today. Giornale degli Scavi, 26 (1938-40) October 1938-July 1940. Giornale degli Scavi, 28 (1938-42) February 1938, June-July 1940. Giornale degli Scavi, 29 (1941-50) October 1942. Bakker 1994 = J. T. Bakker, Living and Working with the Gods. Studies of Evidence for Private Religion and its Material Environment in the City of Ostia, Amsterdam, 1994. Bakker 1999 = J. T. Bakker (ed. ), The Mills-Bakeries of Ostia: Description and Interpretation, Amsterdam, 1999. Bakker 2001 = J. T. Bakker, Les boulangeries à moulin et les distributions de blé gratuites, in J.-P. Descœudres (ed. ), Ostia: port et porte de la Rome antique, Geneva, 2001, p. 179-185. Bakker, online = J. T. Bakker (ed. ), Ostia, harbour of Ancient Rome [On line]. URL : http://www.ostia-antica.org. Balty 1989 = J. -C. Balty, Apamée au VIe siècle. Témoignages archéologiques de la richesse d'une ville, in C. Morrisson, J. Lefort (ed. ), Hommes et richesses dans l’empire byzantin. I. IVe-VIIe s., Paris, 1989, p. 79-86. Bauer et al. 1999 = F. A. Bauer, M. Heinzelmann, A. Martin, A. Schaub, Untersuchungen im Bereich der konstantinischen Bischofskirche Ostias. Vorbericht zur ersten Grabungskampagne, in RM, 106, 1999, p. 289-341. Bianchi et al. 1998 = E. Bianchi et al., Ostia: materiali e tecniche edilizie, Rome, 1998. Bloch 1939 = H. Bloch, Inedita Ostiensia I, in Epigraphica, 1, 1939, p. 37-40. Bloch 1947a = H. Bloch, I bolli laterizi e la storia edilizia. Contributi all’archeologie e alla storia di Roma, Rome, 1947. Bloch 1947b = H. Bloch, The Roman Brick Stamps not published in vol. XV, 1 of the Corpus inscriptionum Latinarum, in HarvStClPhil, 56-57, 1947, p. 1-128. Bloch 1959a = H. Bloch, The Serapeum of Ostia and the Brick-Stamps of 123 A.D. A New Landmark in the History of Roman Architecture, in AJA, 63, 1959, p. 225-240. Bloch 1959b = H. Bloch, Un nuovo caposaldo della storia della architettura romana: il Serapeo di Ostia ed i bolli laterizi dell’anno 123, in Atti del III Congresso Internazionale di epigrafia greca e romana, Roma 4-8 settembre 1957, Rome, 1959, p. 173-174. Boersma 1985 = J. Boersma (ed. ), Amoenissima civitas. Block V, 2 at Ostia. Description and Analysis of its Remains, Assen, 1985 (Scrinium, 1). Calza 1914 = G. Calza, "Ostia", NSc (1914) 69-74. Calza et al. 1953 = G. Calza, G. Becatti, I. Gismondi, G. de Angelis D’Ossat, H. Bloch (ed. ), Scavi di Ostia, I. Topografia generale, Rome, 1953. Bukowiecki – Dessales – Dubouloz 2008 = E. Bukowiecki, H. Dessales, J. Dubouloz. Ostie, l’eau dans la ville : châteaux d’eau et réseau d’adduction, Rome, 2008 (Collection de l’École française de Rome, 402). Cébeillac-Gervasoni – Caldelli – Zevi 2006 = M. Cébeillac-Gervasoni, M. L. Caldelli, F. Zevi, Épigraphie latine, Paris, 2006. Cicerchia – Marinucci 1992 = P. Cicerchia, A. Marinucci, Scavi di Ostia, XI. Le terme del foro o di Gavio Massimo, Rome, 1992. Danner – Vivacqua – Spagnoli 2013 = M. Danner, P. Vivacqua, E. Spagnoli, Untersuchungen zur Chronologie der spätantiken Wohnhäuser in Ostia: Vorbericht zu einem Kurzprojekt im Oktober 2012, in Kölner und Bonner Archaeologica, 3, 2013, p. 217-239. David – Gonzalez Muro 2011 = M. David, X. Gonzalez Muro, Opus doliare e nuovi bolli laterizi dall’insula IV, IX di Ostia, in Société française d’études de la céramique antique en Gaule (SFECAG). Actes du congrès d’Arles, Marseille, 2011, p. 389-396. David – Pellegrino – Turci 2009 = M. David, A. Pellegrino, M. Turci, Scavi della scuola e del dipartimento di archeologia. Italia. Ostia (Roma), in Ocnus, 17, 2009, p. 198-202. David et al. 2014 = M. David, M. Carinici, S. M. Graziano, S. De Togni, A. Pellegrino, M. Turci, Nuovi dati e argomenti per Ostia tardoantica dal Progetto Ostia Marina, in MEFRA, 126-1, 2014, p. 173-186, URL : http://mefra.revues.org/2198. DeLaine 1995 = J. DeLaine, The Insula of the Paintings at Ostia I iv 2-4. Paradigm for a City in Flux, in T. J. Cornell, K. Lomas (ed. ), Urban Society in Roman Italy, London, 1995, p. 79-106. DeLaine 2001 = J. DeLaine, Techniques et industrie de la construction à Ostie, in J.-P. Descœudres (ed. ), Ostia: port et porte de la Rome antique, Geneva, 2001, p. 91-99. DeLaine 2002 = J. DeLaine, Building Activity in Ostia in the Second Century AD, in C. Bruun, A. Gallina Zevi (ed. ), Ostia e Portus nelle loro relazioni con Roma, Rome, 2002 (Acta Instituti Romani Finlandiae, 27), p. 41-102. Di Cola – Medri 2013 = V. Di Cola, M. Medri, Ostia V. Le Terme del Nuotatore. Cronologia di un’insula ostiense, Rome, 2013 (Studi miscellanei, 36). Falzone 2007 = S. Falzone, Ornata aedificia. Pitture parietali delle case ostiensi, Rome, 2007. Falzone – Zimmermann 2010 = S. Falzone, N. Zimmermann, Stratigrafia orizzontale delle pitture delle case a giardino. Modello della fase originaria dei blocchi centrali del complesso ostiense, in AnzWien, 145-1, 2010, p. 107-160. Floriani Squarciapino 1969-1970 = M. Floriani Squarciapino, Terme di Porta Marina o della Marciana (scavi), in FA, 24-25, 1969-1970, n. 8343. Galadini – Galli 2004 = F. Galadini, P. Galli, The 346 A.D. Earthquake (Central-Southern Italy): An Archaeoseismological Approach, in Annals of Geophysics, 47, 2004, p. 885-905. Garofalo Zappa 1971 = G. Garofalo Zappa, Nuovi bolli laterizi di Ostia, in Miscellanea greca e romana, 3, 1971, p. 257-289. Gering 2004 = A. Gering, Plätze und Straßensperren an Promenaden. Zum Funktionswandel Ostias in der Spätantike, in RM, 111, 2004, p. 299-382. Gering 2010 = A. Gering, Genußkultur und Ghettobildung: Ist Ostia repräsentativ für spätantike Metropolen ?, in N. Burckhardt, R. H. W. Stichel (ed. ), Die antike Stadt im Umbruch. Kolloquium in Darmstadt, 19. bis 20. Mai 2006, Wiesbaden, 2010, p. 92-108. Gering 2011a = A. Gering, Das Stadtzentrum von Ostia in der Spätantike. Vorbericht zu den Ausgrabungen 2008–2011 mit Beiträgen von Lena Kaumanns und Luke Lavan, in RM, 117, 2011a, p. 409-509. Gering 2011b = A. Gering, Ein urbanistischer Überblick zur größten Flächengrabung der Römischen Welt: Krise, Kontinuität, Auflassung und Aufschwung in Ostia seit Mitte des 3. Jahrhunderts, in R. Schatzmann, S. Martin-Kilcher (ed. ), Das Römische Reich im Umbruch: Auswirkungen auf die Städte in der zweiten Hälfte des 3. Jahrhunderts. Internationales Kolloquium, Bern/Augst (Schweiz) 3-5 Dezember 2009, Montagnac, 2011 (Archéologie et histoire romaine, 20), p. 301-316. Gering 2013 = A. Gering, Ruins, Rubbish Dumps and Encroachment: Resurveying Late Antique Ostia, in L. Lavan, M. Mulryan (ed. ), Field Methods and Post-Excavation Techniques in Late Antique Archaeology, Leiden-Boston, 2013 (Late Antique Archaeology, 9), p. 249-288. Gering 2014 = A. Gering, Le ultime fasi della monumentalizzazione del centro di Ostia tardoantica. Attività della missione della Humboldt-Universität di Berlino tra il 2009 e il 2013, in MEFRA [En ligne], 126-1, 2014, mis en ligne le 07 juillet 2014. URL : http://mefra.revues.org/2140. Giordani 1982 = R. Giordani, Scavi nella tenuta di Pianabella di Ostia Antica – 1976/1977. La basilica cristiana, in MemPontAc, 14, 1982, p. 57-74. Gonzalez Muro 2013 = X. Gonzalez Muro, Bolli anepigrafi inediti provenienti dall’insula IV, ix di Ostia, in Société française d’étude de la céramique antique en Gaule (SFECAG). Actes du congrès d’Amiens, Marseille, 2013, p. 55-71. Heres 1982 = T. L. Heres, Paries. A Proposal for a Dating System of Late-Antique Masonry Structures in Rome and Ostia (A.D. 235-600), Amsterdam, 1982. Holman, forthcoming = D. Holman, The Coins, in Lavan forthcoming b.
Hori – Lavan 2015 = Y. Hori, L. Lavan, The Potential of Laser Scanning for the Study of Roman Building, in L. Lavan, M. Mulryan (ed. ), Field Methods and Post-Excavation Techniques in Late Antique Archaeology, Boston-Leiden, 2015 (Late Antique Archaeology, 9), p. 595-660. Kockel – Ortisi 2000 = V. Kockel, S. Ortisi, Ostia. Sogenanntes Macellum (IV 5, 2). Vorbericht über die Ausgrabungen der Universität Augsburg 1997/98, in RM, 107, 2000, p. 351-373. Lavan 2001 = L. Lavan, The Praetoria of Civil Governors in Late Antiquity, in L. Lavan (ed.) Recent Research in Late Antique Urbanism, Portsmouth-Rhode Island, 2001 (JRA Supplement, 42), p. 39-56. Lavan 2003 = L. Lavan, The Political Topography of the Late Antique City, in L. Lavan, W. Bowden (ed. ), Theory and Practice in Late Antique Archaeology, Leiden, 2003 (Late Antique Archaeology, 1), p. 314-340. Lavan 2006 = Fora and Agorai in Mediterranean Cities: Fourth and Fifth Centuries AD, in W. Bowden, C. Machado, A. Gutteridge Social and Political Life in Late Antiquity, Leiden, 2006 (Late Antique Archaeology, 3), p. 195-249. Lavan 2011 = L. Lavan, Political Talismans? Residual ‘Pagan’ Statues in Late Antique Public Space, in L. Lavan, M. Mulryan (ed. ), The Archaeology of Late Antique Paganism, Leiden, 2011 (Late Antique Archaeology, 7), p. 439-477. Lavan 2012a = L. Lavan, Public Space in Late Antique Ostia: Excavation and Survey in 2008-2011, in AJA, 116, 2012, p. 649-691. Lavan 2012b = L. Lavan, From Polis to Emporion? Retail and Regulation in the Late Antique City, in C. Morrisson (ed. ), Trade and Markets in Byzantium, Harvard, 2012, p. 333-377. Lavan 2013 = L. Lavan, Distinctive Field Methods for Late Antiquity: Some Suggestions, in L. Lavan, M. Mulryan (ed. ), Field Methods and Post-Excavation Techniques in Late Antique Archaeology, Leiden, 2013, p. 51-90. Lavan, forthcoming a = L. Lavan, Public Space in the Late Antique City, forthcoming. Lavan, forthcoming b = L. Lavan, Public Space in Late Antique Ostia, London, forthcoming. Lavan – Putzeys – Swift 2007 = L. Lavan, T. Putzeys, E. Swift (ed. ), Objects in Context, Objects in Use, Leiden, 2007 (Late Antique Archaeology, 5). Mertens 1969 = J. Mertens, Sondages dans la grande colonnade et sur l’enceinte, in J. Balty (ed.) Apamée de Syrie. Bilan des recherches archéologiques 1965-1968. Actes du colloque tenu à Bruxelles les 29 et 30 avril 1969, Brussels, 1969 (Fouilles d’Apamée de Syrie Miscellanea, 6), p. 61-72. Mols 2001 = S. T. A. M. Mols, La peinture à Ostie, J.-P. Descœudres (ed. ), Ostia: port et porte de la Rome antique, Geneva, 2001, p. 325-33. Noy 1993 = D. Noy, Jewish Inscriptions of Western Europe. I. Italy (excluding the City of Rome), Spain and Gaul, Cambridge, 1993. Patrich 2008 = J. Patrich, Archaeological Excavations at Caesarea Maritima: Areas CC, KK and NN, in E. Stern (ed. ), The New Encyclopaedia of Archaeological Excavations in the Holy Land, 5. Supplementary Volume, Jerusalem-Washington, 2008, p. 1673-1680. Pavolini 2006 = C. Pavolini, Ostia, 2 ed., Rome-Bari, 2006 (Guide archeologiche Laterza, 11). Pensabene 1973 = P. Pensabene (ed. ), Scavi di Ostia, VII. I capitelli, Rome, 1973. Pensabene 2007 = P. Pensabene, Ostiensium marmorum decus et decor. Studi architettonici, decorativi e archeometrici, Rome, 2007 (Studi miscellanei, 33). Ricciardi – Santa Maria Scrinari 1996 = M. A. Ricciardi, V. Santa Maria Scrinari, La civiltà dell’acqua in Ostia antica, 2, Rome, 1996. Schoevaert 2013 = J. Schoevaert, Les boutiques d’Ostie du Ier s. av. J.-C. au Ve s. ap. J.-C. L’économie urbaine au quotidien, 3 vols., Ph.D. Diss, Univ. Paris VII, Paris, 2013. Sole 2002 = L. Sole, Monumenti repubblicani di Ostia Antica, in ArchCl, 53, 2002, p. 137-181. Streubel 2010 = B. Streubel, Ostia - Entwicklung und Visualisierung der Geländeniveaus im Stadtraum, in N. Burkhardt, R. H. W. Stichel (ed. ), Die antike Stadt im Umbruch. Kolloquium in Darmstadt, 19. bis 20. Mai 2006, Wiesbaden, 2010, p. 84-91. Strutt 2005 = K. Strutt, Ostia Antica Geophysical Survey Report: Report 11/2005, Unpublished report. The British School at Rome, Rome, 2005. Underwood 2013 = D. Underwood, Reuse as Archaeology. 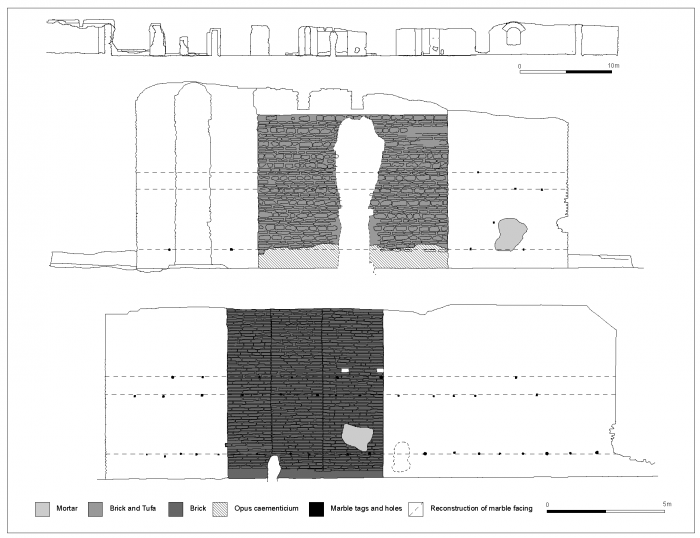 A Test Case for Late Antique Building Chronologies in Ostia, in L. Lavan, M. Mulryan (ed. 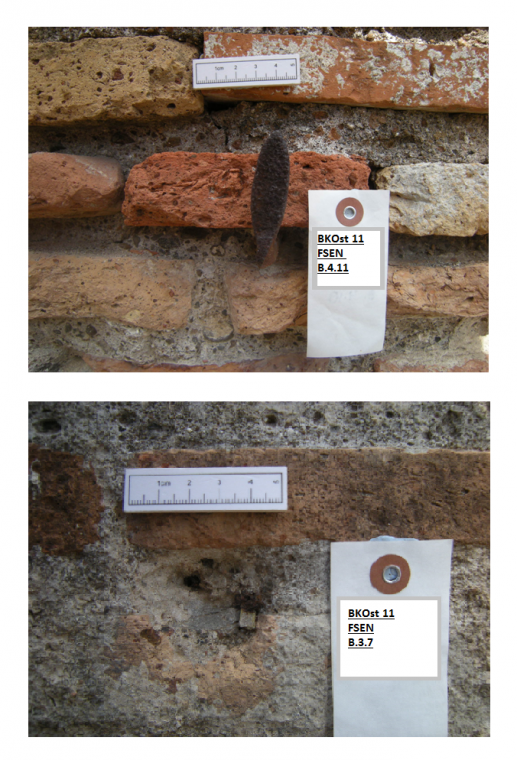 ), Field Methods and Post-Excavation Techniques in Late Antique Archaeology, Leiden, 2013, p. 383-409. Vacarro – Costa, forthcoming = E. Vacarro, S. Costa, The Pottery, in Lavan forthcoming b. Van Dalen 1991 = J. H. Van Dalen, The Late Use of Opus Reticulatum in Ostia, in MededRom, 50, 1991, p. 236-280. Van Der Meer 2012 = L. B. Van Der Meer, Ostia Speaks. Inscriptions, Buildings and Spaces in Rome’s Main Port, Leuven-Paris-Walpole (MA), 2012. Vann 1982 = R. L. Vann, Byzantine Street Construction at Caesarea Maritima, in R. L. Hohlfelder (ed. ), City, Town and Countryside in the Early Byzantine Era, New York, 1982, p. 165-198. Wiemken – Holum 1981 = R. Wiemken, K. Holum, The Joint Expedition to Caesarea Maritima: Eighth season 1979, in BASOR, 244, 1981, p. 27-52. White et al. 2001-present = L. M. White et al., Sinagoga, Ostia Antica in Fasti OnLine, 2001– [On line]. URL : http://www.fastionline.org/record_view.php?fst_cd=AIAC_2521. Wilson 1935 = F. H. Wilson, Studies in the Social and Economic History of Ostia, in PBSR, 13, 1935, p. 41-68. Zevi 1971 = F. Zevi, Miscellanea ostiense I. La carriera di Gavio Massimo e i restauri tardi alle Terme del Foro, RendLinc 26, 1971, p. 449-479. Zevi – Geremia Nucci – Falzone 2004-2005 = F. Zevi, R. Geremia Nucci, S. Falzone, Ostia. Sondaggio stratigrafico in uno degli ambienti della Domus dei Pesci (1995 e 1996), in NSc, 15-16, 2004-2005, p. 21-327. 1 Fieldwork up to 2011 : Lavan 2012a. I am not a specialist in Italian archaeology, nor in Ostia. The focus of my publications to date has been the historical reconstruction of urban life, at a synthetic level : Lavan 2001, 2003, 2006, 2011 and 2012b, with essays in Lavan – Putzeys – Swift 2007. 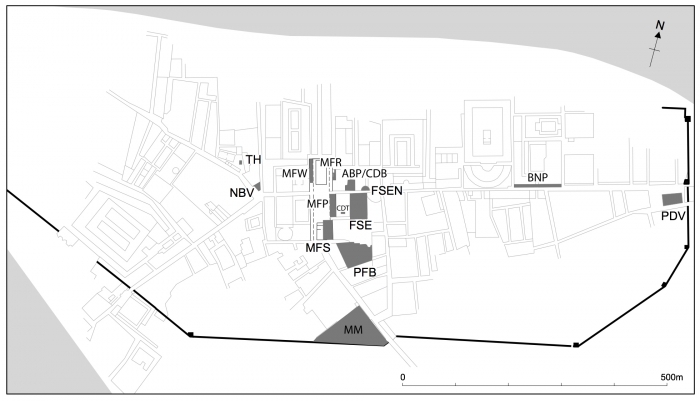 2 Streets of Ostia, and their potential : Gering 2004 and 2011b, esp. fig. 7 and 8 with its classification of streets. 4 Rapid excavation : Calza et al. 1953, p. 38 ; Bakker 1994, p. 5 ; See also « The excavations for the Esposizione universale di Roma (EUR), 1938-1942 » on the website Ostia, Harbour City of Ancient Rome : http://www.ostia-antica.org/dict/topics/excavations/excavations16.htm. 5 Dating based on Heres : Schoevaert 2013 vol. 2 passim. Underwood 2013, p. 383-409 does the same thing. 6 Site syntheses using earthquakes or masonry facing : Bakker (online) passim and Pavolini 2006 passim. 8 Inscriptions and the dating of Late Republican/Early Imperial buildings (such as the Forum Baths, Baths of Neptune, Theatre or City Wall) : CIL XIV, passim; Van der Meer 2012, passim. 9 Brick stamps : Bloch 1939, Bloch 1947a-b and Bloch 1959a and b ; Garofalo Zappa 1971 ; David – Gonzalez Muro 2011 ; Gonzalez Muro 2013. Architectural dating : Bianchi et al. 1998 ; DeLaine 2001 and 2002 ; Pensabene 1973. Artistic dating (wall paintings) : e.g. Mols 2001 ; Falzone 2007 ; Falzone – Zimmermann 2010. 10 Masonry facings from Republican to Severan times : Heres 1982, but see also Van Dalen 1991 for opus reticulatum. 11 Street levels : for an overview see « Regio V - Insula XI - Monumento Repubblicano (V, XI, 6) » on the website Ostia, Harbour City of Ancient Rome : http://www.ostia-antica.org/regio5/11/11-6.htm. Domitianic level theories : Wilson 1935, p. 49, 53-54 ; Meiggs 1973, p. 64-67 (based on masonry styles, cross referenced with inscriptions or brick stamps for the Baths of Neptune and Caserma dei Vigili, Temple of Piazzale delle Corporazioni and Curia) ; Sole 2002. 12 Fires, as in Caseggiato dei Molini : Bakker 2001, p. 179 sq. ; Bakker 1999, p. 32 n. 41. Impact on Exedra : Gering 2011a, p. 309-310. 13 Stratigraphic dating at Ostia : Pianabella basilica : Giordani 1982 ; Insula of the Paintings (Reg. I, iv, 1-5) : DeLaine 1995 ; Macellum (Reg. IV, v, 2) : Kockel – Ortisi 2000 ; « Constantinian » Church (Reg. V) : Bauer et al. 1999 ; Domus accanto al Serapeo (Reg. III, xvii, 3) and Domus delle Colonne (Reg. IV, iii, 1) : Danner – Vivacqua – Spagnoli 2013 ; Domus dei Pesci (Reg. IV, iii, 1) : Zevi – Geremia Nucci – Falzone 2004-2005 ; Porta Marina : e. g. David – Pellegrino –Turci 2009, David et al. 2014 ; Terme del Nuotatore : Di Cola – Medri 2013. Main Forum and Foro della Statua Eroica (Reg. I, xii, 2) : Gering 2011a ; Foro della Statua Eroica (Reg. I, xii, 2), Main Forum, Ninfeo Bivio (Reg. I, xiv, 1), Terme del Foro (Palaestra) (Reg. I, xii, 6) : Lavan 2012a ; Synagogue (Reg. IV, xvii, 1) : White et al. 2001-present. 14 Late brick stamps : e. g. Cicerchia – Marinucci 1992, p. 234 D6-8. Porta Marina brick stamps : Floriani Squarciapino 1969-1970 ; Garofalo Zappa 1971. 15 Late column capitals : Pensabene 2007, p. 275 on the capitals of the Palaestra ; Pensabene 1973 p. 44, n. 140-146 compares with other capitals elsewhere in Ostia (which he has himself dated) but uses parallels from Rome in other places, e. g. p. 100-101, n. 360, such as capitals from S. Paolo fuori le mura. 17 Earthquake of 346 : Jer., Chron. Olympiad 281 (A.D. 346). Earthquake of 375: Symm., Ep., 1, 3, 4 (noted at Beneventum). Discussion of central Italian epigraphic evidence : Galadini – Galli 2004. 19 Street levels changes, explanations e.g. : Hori – Lavan 2015, p. 626-631 ; Gering 2010, p. 105-106 ; Gering 2011b, p. 2-3 (from proofs of manuscript) ; Streubel 2010, p. 90. 20 Street levels in the East (slabs overlain), at Apamea (6th c.) : Mertens 1969, p. 6, Balty 1989, p. 80-81 ; at Caesarea Maritima : Vann 1982 with Weimken – Holum 1981, Patrich 2008, p. 1674-1675. 21 Localised levels (esp. via di Diana) : Hori – Lavan 2015, p. 626-632 ; (Main Forum) : Lavan 2012a, p. 654, 656. The statement that different heights coexisted here comes from observing the revetment added to the forum portico wall, by the Baths, after the wall was rebuilt in the 3rd c. One section of the restored wall was decorated down to the old floor, whilst the other half was not, but featured a new doorway set at a higher level. 23 Associative dating (coin finds) : Boersma 1985, p. 81, 100-103, esp. 253 ; (honorific inscriptions) : Pensabene 2007, p. 481-483, noting association of Urbs Romae statue of ca. 380-389 with late portico by theatre, CIL, XIV, 4621 and 4716 = AE, 1910, p. 195 ; (building inscriptions) : Ricciardi – Santa Maria Scrinari 1996, p. 94, n. 1, Gering 2004, p. 341 with n. 106 noting association of fragmentary inscription CIL, XIX, 4718 used by Ricciardi – Santa Maria Scrinari to date the Exedra, whilst Gering 2013, p. 269 considers the inscription to be spolia reused in the paving of the exedra. I myself am not sure we can assert it was reused, as I have not seen any find context established for it. 24 Contextual dating (ceramics) : for Temple of Hercules, Main Forum Sidewalk, Foro della Statua Eroica phase 1a, see n. 25 ; for the Bivium and Foro della Statua Eroica phase 2 : see for these finds, Holman, forthcoming ; Vaccaro – Costa, forthcoming. Only the former group of sites are critical here. 25 Masonry facings (bricks with short tufa levelling courses) dated to the mid to later 3rd c. by ceramic deposits (if one allows building to take place in the 25 years after the start date of the last ceramics or coins, which is acceptable for secondary deposits dumped as fill) : (i) in wall of Foro della Statua Eroica (part of FSE phase 1a), dated by context 1017, deposit of first half of 3rd c. based on massive deposit notably with fine wares notably including ARS C1 dish Hayes 50A and the other ARS A/D dish Hayes 32) ; (ii) in blocked arch of Cardo and in rebuilding of wall of portico, both facing onto the forum, in area « Main Forum Sidewalk », dated by context 5046, deposit of the first half/mid 3rd c. A.D. with reliability 2.5/4 based on pottery of first half / mid 3rd c., including fineware of Hayes 31, n. 2 in ARS A/D (first half of the 3rd c. A.D.) ; Hayes 10, n.3 in ARS A2 (A.D. 220/25-300 and possibly beyond). Hayes 32 (first half of the 3rd c. A.D.) and amphorae of Amphora Africana II C1 = Keay 6 (mid 3rd to early 4th c. A.D.) ; Amphora Africana I B (late 2nd to the mid 3rd c. A.D.) ; Keay 1B (Dressel 30) (between the 3rd and 4th c. A.D.) ; this compact deposit also contained coins of Philip II Caesar (244-47) and Decius (249-51) pushing its date to after 249 ; (iii) within the Temple of Hercules area, for a building facing onto Via della Foce, built at a level above dump deposit context 16010 = 17001 (within an adjacent structure set at a lower level) of 3rd c. date with reliability 1/4 with amphora Gauloise 4 and dish/lid Hayes 196A, plus coin of Gordian III 240-44 and mid-3rd c. coin. For these finds see Holman, forthcoming ; Vaccaro – Costa, forthcoming. 26 Masonry facings (large-scale reuse of brick) : (i) phase 1b of the Foro della Statua Eroica (FSE) has very messy reused brick in its stylobate foundation, dating after a new apse of the Forum Baths. The apse has been dated to the Maxentian/Constantinian period (based on brickstamps), whilst coins from the fill layers of the initial paving stop with issues of Maxentius and Constantine : Cicerchia – Marinucci 1992, p. 72, 234 D6-8 = CIL, XV, 1613 (for brickstamps) ; Gering 2011, p. 500 (for coins). Context 4049 beneath a portico mortar floor also suggests a 4th c. date, containing notably ARS A Hayes 15 (4th c.) and Hayes 10 (until end of 4th c.) plus Tunisian Kitchen Ware Hayes 196 (4th to early 5th c.) and Hayes 181D (mid-4th to mid 5th c.) : see Vacarro – Costa, forthcoming ; (ii) repair of nymphaeum opposite FSE has rebuilt corner of badly-sorted reused bricks, rebuilt at the same time as a thin marble revetment was added, but before the street level of the Decumanus rose, likely sometime before ca. 389. This terminal date is suggested by an honorific inscription associated with the theatre portico, built at a higher level. It ante-dates structures which were likely built after the « earthquake of 346 » : Lavan, forthcoming b with n. 22 above. 27 Opus vittatum mixtum (temple of Hercules) : this wall had its foundations sat in deposit context 16010 = 17001, for which see n. 25. 30 Removal of late walls and floors : Archive photos : B2903, 7th March 1940 - southern portico of the Palaestra of the Forum Baths during its excavation. Looking south, B2943 : sometime 1939-40 - wide view of Palaestra looking south-east after excavation. 31 Restoration of columns : archive photo B2943 ('1940') and B2903 (7th March 1940) showing no columns, except one fragment in situ on portico) and A2123 : sometime in 1929 looking north towards reconstructed façade of Baths. Column fragments visible in middle of plaza : A2123 (1929), B2897 (of 13th Jan 1940). Columns reconstructed : B3205 (1957, at least one). 33 Publication of masonry structures publication (of Forum Baths) : Cicerchia – Marinucci 1992, especially p. 22-24, p. 133-39, with map 1c for Palaestra. Survey of Palaestra piers : Heres 1982, p. 393-401 (of masonry) and Pensabene 2007, p. 275 (of marbles). 34 For a complementary illustrated account of the Palaestra excavations, but superseded by my text here, see Lavan 2012a, p. 656-667. 36 Accepted view of the Palaestra history : Cicerchia – Marinucci 1992, p. 22-24, 135-138 ; Pensabene 2007, p. 273-275 ; see also Pavolini 2006, p. 410. 37 Fl. Octavius was praefectus annonae sometime after 326 : he is named on another inscription as vir clarissimus ; a rank which this post of prefect only acquired after 326. For the inscriptions see firstly (for the Latin inscription) Cicerchia – Marinucci 1992, p. 216 C105 and (for the Greek inscription) Cicerchia – Marinucci 1992, p. 219-220 C107 = Zevi 1971, p. 467 n. 49 plate 1, fig. 2 = CIG, 6182 = IG, XIV, 1073b = 7100b ; cf. PLRE 1.638 Fl. Octavius was a praefectus annonae sometime in the 4th c., whom Cicerchia – Marinucci 1992, p. 216 situate after A.D. 326, due to his rank as vir clarissimus ; this office was reserved for them after 326. I do not know why they also place the works after 331. For the identification of Fl. Octavius as vir clarissimus and praefectus annonae, see CIL, XIV, 4714, cited and discussed by Cicerchia – Marinucci. A further inscription from the Vatican museum, of unknown provenance, refers to baths and to the name Maximus, so may come from these « Baths of Gavius Maximus » (the name of the Forum Baths in inscriptions) : Cicerchia – Marinucci 1992, p. 220, C107bis = CIL, VI, 29769. Its use of the phrase divinae mentis ductu recalls the phrase instinctu divinitatis of the Arch of Constantine, which has probably encouraged the other inscriptions to be ascribed to a Constantinian period. 38 Brick piers : Heres 1982, p. 388-389, 401 and 393 with fig. 72, with reinforcement pier 25 stated as being of the early 4th c., the rest being of the first quarter of the 3rd c.
39 Theory that first portico was built of piers : Cicerchia – Marinucci 1992, p. 138 ; Pensabene 2007, p. 275. 40 Small temple as fountain : Lavan 2012a, p. 664-667. Fontana con lucerna : Ricciardi – Santa Maria Scrinari 1996, p. 157-161. 41 We are grateful to the authors of Strutt 2005, a BSR magnetometer survey of the Palaestra, which produced similar results, for access to their work, which came to light after our survey was completed. 42 The blocked arch incorporated a drain set above the demolition level of the forum portico, at a height shared with a drain in the rebuilt rear wall of the forum portico, which still served as the boundary of the baths. Both drains dangle in the air ca. 50 cm above the level of the demolished and denuded forum portico on which deposit 5046 was found, for which see n. 25. 43 Function : Pavolini 2006, p. 110, suggests that it might be a « sala per lettura pubblica », because of a raised loggia with colonnaded entrance added on one side in a late phase. 44 Evolution of water supply : Bukowiecki – Dessales – Dubouloz 2008, p. 169-194. Severan peak : Ricciardi – Santa Maria Scrinari 1996 p. 259. Appearance of cisterns in Piazzale della Vittoria Nymphaeum (secondary), Bivium Nymphaeum and elsewhere : Gering 2004 p. 316-317 n. 49 and p. 362-63. 45 Inscription of Nymphaeum : CIL, XIV, 4624. See total reconstruction in Noy 1993, p. 28-29 n. 15 : CIL, XIV, 4624a = AE, 1915, 55 = AE, 1998, 272a = Cébeillac-Gervasoni – Caldelli – Zevi 2006, p. 303-305, n. 94.5. 46 In context 5300 was found ARS Hayes 50A (given as 230/40 to 325), Tunisian amphora Africana IIC variant 1 (given as late 3rd to first half of the 4th c. A.D.), Tunisian amphora Africana IID (given as mid 3rd to first third of the 4th c. and beyond), Tunisian kitchen ware Hayes 182C/D (a transitional variant between 2nd to 3rd c. and mid 3rd to 4th c. wares), Asia Minor or Black Sea amphora Käpitan 1 (common between second half of the 2nd and the 4th c. A.D.), Italic lamp Bailey Q(x)? (of Severan period and later). In context 5301 was found Mauretanian amphora Dressel 30 (3rd to 4th c.), Asia Minor or Black Sea amphora Käpitan 2 (second half of the 2nd c. to the 4th c.), Tunisian kitchen ware Hayes 182C/D (see above), Tunisian kitchen ware Hayes 197 (3rd and 4th c. A.D. probably), Italic lamp Bailey Q(x) or Bailey R (the first dated to the Severan period and the second between the late 3rd and the early 5th c. A.D.). 48 Earthquake of 443 : recorded in Rome by the Fasti Vindobonenses Posteriores 556-557 (consulate of Maximus and Paterius, A.D. 443) and Paul., HR, 13, 16 (no obvious date, although it is listed a little before the death of Theodosius II died A.D. 450). Gering 2014, p. 217, n. 18 (relating the first to possible repairs in the Main Forum, supported by a ceramic deposit he believes to be not earlier than the second half of the 5th c. with LRA 1a/ transition amphoras). Another earthquake sometime in or before 484 (when damage to Colosseum repaired, as recorded by statues found there) : CIL, VI, 1716 a, b, c = 32094 = ILS, 5635 (describing earthquake damage, repaired by PLRE, II, 218 Decius Marius Venantius Basilius 13, consul in A.D. 484 when also Prefect of the City). 49 Forum of Caesar, stripping of the paving in two tabernae (10 and 11) in first half of 5th c. : Corsaro et al. 2013, p. 127-131. Palaestra pits : fills cut into the portico floor included finds no later than a possible coin of ca. 410-35 (from context 2068, pit near small temple) and 4th-mid 5th c. Keay 25 (from context 2207-2130, pit near surviving basin against portico), whilst a beaker lamp/rim of the late 4th-first half 5th c. came from context 2056, the robber trench for the portico’s lead pipe. 50 Minimal documentation, after the war (for Temple of Hercules) : Giornale degli Scavi, 29 (1941-50) for October 1945, August 1946 ; Giornale degli Scavi, 31 (1955-56) for May to August 1955, which sounds very much like clearance excavation « We completely emptied the piazza of the Temple of Hercules » (6th August). LAVAN, Luke. Chronology in Late Antiquity : a Lesson from the Palaestra In : Ricerche su Ostia e il suo territorio : Atti del Terzo Seminario Ostiense (Roma, École française de Rome, 21-22 ottobre 2015) [en ligne]. Rome : Publications de l’École française de Rome, 2018 (généré le 23 avril 2019). Disponible sur Internet : <http://books.openedition.org/efr/3814>. ISBN : 9782728313334. DOI : 10.4000/books.efr.3814. Lavan, Luke. “Chronology in Late Antiquity : a Lesson from the Palaestra”. Cébeillac-Gervasoni, Mireille, et al.. Ricerche su Ostia e il suo territorio : Atti del Terzo Seminario Ostiense (Roma, École française de Rome, 21-22 ottobre 2015). Rome : Publications de l’École française de Rome, 2018. Web. <http://books.openedition.org/efr/3814>. CÉBEILLAC-GERVASONI, Mireille (dir.) ; LAUBRY, Nicolas (dir.) ; et ZEVI, Fausto (dir.). 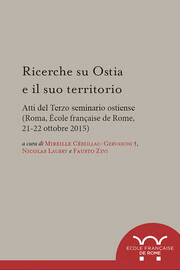 Ricerche su Ostia e il suo territorio : Atti del Terzo Seminario Ostiense (Roma, École française de Rome, 21-22 ottobre 2015). Nouvelle édition [en ligne]. Rome : Publications de l’École française de Rome, 2018 (généré le 23 avril 2019). Disponible sur Internet : <http://books.openedition.org/efr/3637>. ISBN : 9782728313334. DOI : 10.4000/books.efr.3637.